As far as longevity and ease of use go, this lightweight and dual-sided crib mattress gives you the best bang for your buck. No money-back guarantee, though. What’s in a Moonlight Slumber Little Dreamer Crib Mattress? What Can Be Used with the Moonlight Slumber Little Dreamer Crib Mattress? What’s the Weight Capacity of the Moonlight Slumber Little Dreamer Crib Mattress? Does Moonlight Slumber Offer a Sleep Trial, Return Policy and Warranty? How Much Does the Moonlight Slumber Little Dreamer Crib Mattress Cost? The Little Dreamer is one in the huge line of Moonlight Slumber maternity and nursery products for mothers and children. Since 2002, the Illinois-based company has come out with accessories, pillows, pads and mattresses of all sizes. In 2017, though, Moonlight Slumber was embroiled in the Federal Trade Commission (FTC)‘s first case ever against a company making claims about the organic nature of the materials of their products. To be clear: The products in question were the Starlight Simplicity and Little Star mattresses, not Little Dreamer. The result was a consent order that basically ensures that Moonlight Slumber never makes misleading representations of their products from that point on, which is actually a great for those looking into purchasing a Moonlight Slumber product now! Back to the review at hand: The company claims that their Little Dreamer is the best parent-reviewed crib mattress online, but what makes it so special? That’s what we set to find out. The Little Dreamer mattress ticks all the boxes: Proudly made in the USA, CertiPUR-US and GREENGUARD Gold certified, and compliant with CPSIA (Consumer Product Safety Improvement Act of 2008). Moonlight Slumber claims that the Little Dreamer is non-toxic: antimony free, lead free, phthalates free, PVC free, vinyl free and devoid of flame-retardant chemicals—while still being odor-resistant, stain-resistant, water-resistant, antimicrobial and meeting all federal and US state flammability requirements. On top of all this is what Moonlight Slumber calls a two-stage sleep system, which means that your little one can use both sides of the Little Dreamer. Similar to the Colgate Eco Classica III, the Little Dreamer has an infant side and a soft and toddler side. The Little Dreamer is comprised of two layers of “plant based” foam—one side is extra firm for infants and the other is more plush for toddlers. Combined, the two layers amount to five inches thick. While it’s not specifically mentioned in the product details, we were concerned by the possibility of harmful adhesives in the mattress. Not to worry, though: In the Moonlight Slumber FAQ on their official website, it’s noted that any adhesives used in their products are from Simalfa, a company that’s also GREENGUARD Gold certified. That being said, we still think that calling a material “plant based” is not sufficient. We appreciate the certifications, but not being completely transparent about the type of foam used in a mattress is passé, especially with the current trend of “bed in a box” mattress companies touting their respective patented constructions and foam formulations. What Is “Plant Based” Foam? We looked online and found academic references to polyurethane foam that’s soybean oil-based and using plant oils in foam manufacturing. This may be what Little Dreamer is talking about. What Is the Moonlight Slumber Little Dreamer Crib Mattress Cover Made From? The two layers of “plant based” foams are enveloped in a woven fire barrier first, and then mattress cover made from a non-toxic medical grade stretch nylon knit fabric. It is this deluxe and durable—but non-removable—crib mattress cover that really makes the product resistant to odor, stains, water and pests. This is also likely the reason it is hypoallergenic and very easy to spot clean. The Little Dreamer is also said to be dust mite and bedbug resistant due to its cover’s SafeSewn seams, which are dropped to the sides and flat. This also makes cleanup and sheet changes easier. Can You Customize the Moonlight Slumber Little Dreamer Crib Mattress? There is an optional celery green waterproof ribbon with the Moonlight Slumber Logo that can run right in the middle of the mattress sides. Apart from this, there are no other customizations available. Moonlight Slumber Little Dreamer is one of the most popular crib mattresses in the market. It’s earned several industry awards and is consistently included in many publications’ top lists. We think it has something to do with a combination of its longevity and ease of use. It comes in the standard crib mattress size of 27.5 by 52 inches and is light at 8.2 pounds, too. The price point provides great value for money considering how long your little one can keep using the Little Dreamer. As the Little Dreamer is CPSIA compliant, it follows that any crib of standard size can be used with it. The crib mattress fit should be safe and snug, particularly because of the square corners of the crib mattress. We mention this is in every crib mattress review, just to be safe: If you’re not sure that your crib is of a standard size, perform the two finger test and check for too much space between the crib and the mattress. More than the width of two fingers means that the two products aren’t compatible! Change one of the two to avoid accidents and possible danger to your little one. Additionally: Because it is a dual-sided crib mattress, note that some baby monitors using sensor pads may not work well with it. How Do You Set Up the Moonlight Slumber Little Dreamer Crib Mattress? Packaging is simple and frustration-free. The Little Dreamer’s GREENGUARD Gold certification ensures that little to no VOC emissions should occur. If you notice a slight “new mattress” smell right out of the box, simply leave the product to rest in a well ventilated place for a few hours and it should disappear shortly. The two sides should be clearly marked and indicated by a tag as the side of the mattress. 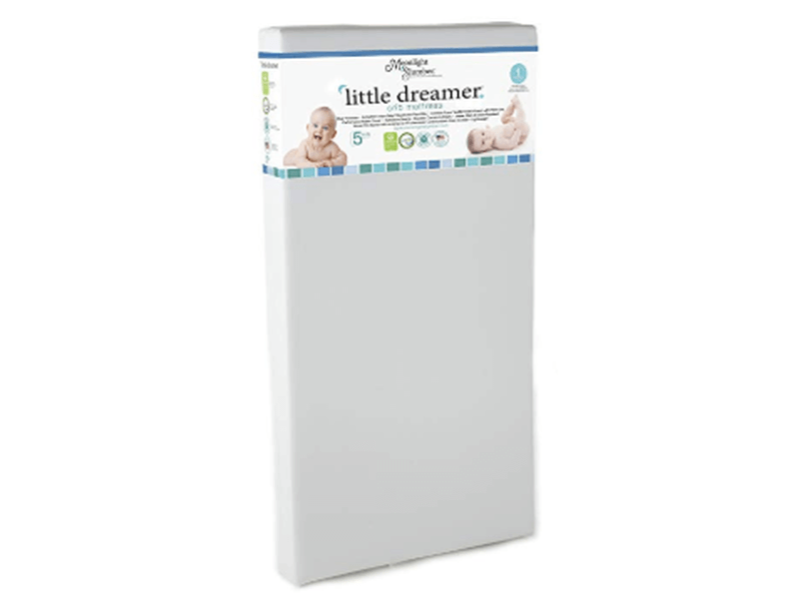 The Little Dreamer is lightweight enough that changing sheets shouldn’t be a problem; let alone moving the crib mattress for travel or redecoration. 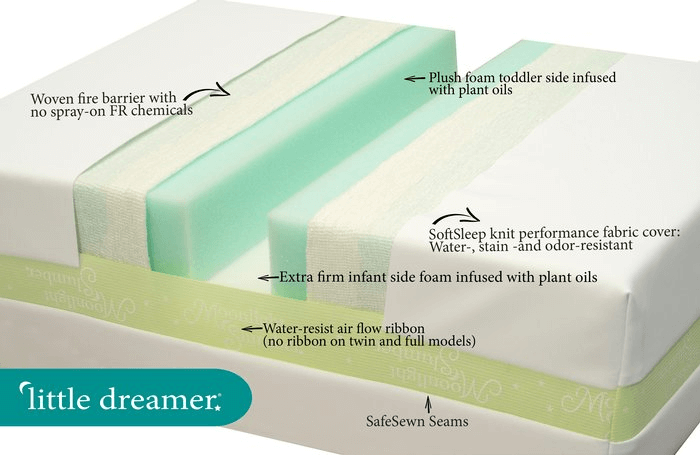 How Do You Clean the Moonlight Slumber Little Dreamer Crib Mattress? The Little Dreamer is sold on the official Moonlight Slumber website with an optional waterproof-backed cotton mattress pad. While the crib mattress cover itself is water resistant, spot cleaning it can be a chore. A mattress pad can keep a mattress surface cleaner and less prone to spills and accidents. Whether you’re using mattress pads as an extra layer or only using sheets, cleanup is essentially the same: Change and wash the pads and sheets as needed. Spot clean the crib mattress cover carefully and make sure it’s completely dry before putting on a new set of bedding. The Little Dreamer is sold and advertised as a dual-sided mattress that can be used up to toddler years, so it should be safe to assume that it can at least support up to 35 pounds, the average weight of a three-year-old. It is curious, though, that there is no weight capacity—or age limit, for that matter—mentioned or displayed prominently on the brand’s official website. We’ve seen no complaints regarding this issue. If the crib mattress does start to show significant problems due to weight put on it—and the child using it is still toddler age—chances are you can take advantage of the full lifetime warranty and have it replaced. How Does the Moonlight Slumber Little Dreamer Crib Mattress Feel? As previously stated, the infant side is extra firm and the toddler side is much softer. Some reviews online we’ve seen mention that the infant side is too firm, but we chalk that up to personal preference. After all, that’s how it’s supposed to be. Infants are not very safe if sleeping on a soft surface, due to the risk of suffocation and other dangers. As crib mattress makers go, Moonlight Slumber sits on the fine line between old and trusted brands like Colgate and new industry shakers like Newton Baby. That Moonlight Slumber’s offerings are made in the USA is a nice touch. That they make more than crib mattresses is a positive for us, too. As far as promise goes, the one that the Little Dreamer makes is huge. That is, that it will keep your little one company in their dreams throughout infant and toddler years, up until your child is ready to graduate to a regular mattress. We like that this promise is supported by a warranty and that the dual sides are optimized for the respective needs of the two age ranges. Having combed through hundreds of Little Dreamer customer reviews online, we are also confident in saying that the feedback is overwhelmingly positive. The small percentage of negative reviews mostly stem from misunderstandings that we feel wouldn’t happen if the FAQ were a little bit more extensive. For example: Some complaints have to do with the material being listed as “100% polyurethane foam” on the crib mattress tag. This is not incorrect, and still counts as foam infused with plant oils. Others complained that the mattress cover seems too thin, but this is subjective and easily remedied by a mattress pad or sheets. We didn’t find any alarming feedback—no complaints about heat retention, allergic reactions, or breathability. How is Moonlight Slumber’s Customer Support? Here is one aspect that really shows us how the Little Dreamer got so popular. Customer support is great, in our experience! Responses are quick and informative. There is a telephone number listed, as well as an email address and a contact form on Moonlight Slumber’s official website. However, the FAQ leaves a lot to be desired. Product details are not as specific as we would like, either. No return policy is stated on the official website, but there is a full lifetime warranty. However, should you purchase the Little Dreamer from other retailers, their return policies may apply. For example, if you purchase the Little Dreamer on Amazon, you can benefit from free returns. About the warranty: It doesn’t apply should the mattress cover somehow retain odors or stains, or the mattress suffer damage or warping due to incorrect usage. It does cover factory and craftsmanship defects, though. Note that to avail of the warranty you need to register the product on Moonlight Slumber’s official website. The Little Dreamer’s price is listed as $196.90, not including shipping, on both the Moonlight Slumber official website and Amazon. The former requires an additional shipping fee of $35 and is limited to US addresses only—not including PO Box or APO addresses—while the latter notes that the Little Dreamer qualifies for both free shipping and free returns. Mattress recycling fees also apply for affected US states. The price sits at the average when it comes to a high quality dual-sided mattress. It seems affordable enough for a long lasting product, though it regrettably doesn’t have a sleep trial or money-back guarantee. Visit Amazon & Find Moonlight Slumber Little Dreamer Deals Now! We’ve dug deep to find out why the Moonlight Slumber Little Dreamer is so beloved by their customer base. Now we find that we understand the hype. It really feels like a no-nonsense product: simple construction, simple materials, simple promises. There’s no newfangled component or innovative design, unless you count the dual-sided nature of the crib mattress, but that idea is not unique to the Little Dreamer. But there are a lot of comforting certifications and a long enough company track record that’s filled with satisfied customers. If you’re in the market for something unique and technologically advanced, this might not be for you. If you’re looking for a workhorse of a crib mattress, this might be it. As far as dual-sided crib mattresses go, the Little Dreamer gives you the most bang for your buck. There’s nothing special about it, but no nasty surprises in store, either. We do recommend that you buy it from a retailer with a return policy, though—just in case your little one doesn’t like that it’s “extra firm”.